In the United Kingdom we should be deeply grateful that providence has given us a Christian constitution that acknowledges the true God and the authority of his Word. The European Union is a supranational organization which, despite being composed of twenty-eight member states, is increasingly exercising the functions of a single state. It has a Parliament, a Government, and a currency – the Euro. However, the EU does not acknowledge the true God and his Word. The EU is itself a successor organization to the European Economic Community, which was formed by the Treaty of Rome in 1957. The United Kingdom joined what was then the European Economic Community in 1973. In 1992, under the terms of the Maastricht Treaty, the EEC was renamed the European Union, and has played an ever greater role in our national life. It makes many of our laws. It controls many of our decisions. It plays an enormous and increasing role in the functioning of our economy. It determines our system of immigration. It affects our national security. It is involved in every aspect of our country’s life. In 1957, twelve years after the end of the Second World War, a group of six countries, France, West Germany, Italy, Belgium, Luxembourg, and the Netherlands signed the Treaty of Rome. This brought into being what was then known as the European Economic Community. This created the basic institutions of what is now the EU. It expanded in 1973 to include the United Kingdom, Denmark, and Ireland. Greece joined in 1981. Portugal and Spain joined in 1986. These twelve countries were all signatories to the Maastricht Treaty of 1992. This created the European Union, which replaced the EEC, and led to the creation of the new European currency – the Euro. In the years following Maastricht sixteen further countries joined the EU. These included Austria, Sweden, and most of the countries of the old Soviet-dominated Warsaw Pact. Eastern bloc countries that since the end of the Second World War had been controlled by Moscow are now governed from Brussels. In 2002 the first issuance of Euro bank notes and coins took place. The Euro is now used by 19 out of the 28 member states of the EU. It is printed and controlled by the European Central Bank in Frankfurt. The ECB decides monetary policy for the Eurozone. It also sets interest rates. In 1992 Britain signed the Maastricht Treaty but opted out of membership of the Euro. In order to understand how this complicated and unwieldy institution came into existence one has to have an understanding of the history of Europe immediately before the EEC was founded. The impetus behind the founding of the EEC was the Second World War. In the half century before its creation, Europe had been ravaged by two bloody world wars. Both wars had been started by Germany but, on both occasions, Germany lost. In the Second World War Germany committed appalling war crimes, particularly in the attempted destruction of the Jewish people. France fought courageously and, ultimately, victoriously in the First War. But in the Second she was invaded by Germany and surrendered within weeks. She was an occupied nation for four years. During those four years, although there was some French resistance, there was a collaborationist French government. And there was a great deal of French collaboration on the ground. When the war finally ended, Germany was divided into a Soviet-dominated East and a Western-aligned West Germany. France began a painful recovery. The origins of a supranational European alliance sprang from the desire of France and Germany never to go to war again. And never to plunge the continent of Europe – and the world – into war again. This led to the formation of the European Coal and Steel Community in 1952. It created a common market for coal and steel. It was formally established by the Treaty of Paris. It was followed by the EEC in 1957. Clearly, peace was one of the main objectives of the EEC. And peace is a laudable aim. But it is worth looking closely at the beliefs of the men who were instrumental in bringing the EEC into existence. Of the original six member states of the EEC the three main nations were France, West Germany, and Italy. There were four main founding fathers – Jean Monnet and Robert Schumann from France, Konrad Adenauer from Germany, and Alcide de Gasperi from Italy. All four were devout Roman Catholics. One cannot understand the formation of the EEC without having an understanding of their creed. Roman Catholicism has always had a strong view of top-down redistributive social justice administered by a powerful and unaccountable hierarchy. The Church of Rome during the medieval period certainly believed in helping the poor. It also believed in a powerful, political, and unaccountable church. This has been curiously mimicked in the structures of the contemporary European Union. A large amount of EU expenditure to different regions is financed by taxation. But the decisions to spend, or not to spend, are taken by an unaccountable political hierarchy. Interestingly, this legacy of Roman Catholic social policy within the EU coexists with a strong commitment to human rights. This terminology derives strongly from the thinking of the 18th century Enlightenment. It involves a rejection of divine revelation as the source of our knowledge of right and wrong. Instead, human beings have certain ‘self-evident’ rights. How we are supposed to know what these rights are is not clear. Rights-based ethics make man the centre of morality. However, Scripture teaches us that right and wrong are not grounded in man but in God. God tells us what is right and what is wrong – and these standards are an expression of his holy and perfect character. A Christian view of morality emphasizes not so much rights as responsibilities. Enlightenment thinking also denies that man is fallen. The doctrine of original sin tells us that fallen man, although created in the image of God, has an inbuilt bias towards sin and evil. This bias can, ultimately, only be dealt with by the Holy Spirit of God in the New Birth. But, at a social level, it can be restrained by wise and just laws. The Church of Rome does not have a scriptural view of original sin, since it does not believe in the total depravity of man. Rome teaches that in the fall man lost certain divinely granted gifts rather than being totally corrupted. This means that Rome can affirm that man can, in some respects, better himself. This is a false view of law and an unsound basis on which to make laws. Nonetheless, the whole structure of EU lawmaking is based on human rights theory, and its treaties have lengthy assertions of the different basic rights that the EU recognizes. These rights have very often directly interfered with British national sovereignty, particularly in cases of extradition. When the UK entered the EEC in 1973 we were told by the then Prime Minister Edward Heath that our membership of the EEC would have no implications for national sovereignty. However, there can be no doubt that the founding fathers of the European Union thought otherwise. They wanted a European federal state. Jean Monnet said ‘There will be no peace in Europe if the States rebuild themselves on the basis of national sovereignty’. The European Union has a complicated and unaccountable system of government. There are seven main institutions that are fundamental to its operation. These are the Commission, the Council of the European Union, the European Council, the European Parliament, the European Court of Justice, the European Central Bank, and the Court of Auditors. We will concentrate on the first four. The most important is the European Commission. This is the executive body of the EU. In effect it is the EU’s government. It has 28 members with one commissioner for each country. That commissioner is not directly voted into office, but appointed by the government of each member state. The current UK commissioner is Sir Julian King. The Commission proposes legislation, which it does in secret. It implements treaties and is responsible for the day-to-day running of the EU. It has a vast civil service of 23,000, which has 37 branches or Directorates General. The Directors General have enormous power. 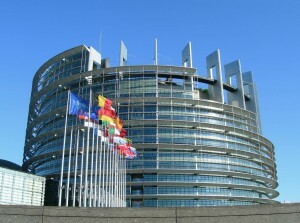 The Commission is based in Brussels. The current President of the Commission is the ultra-federalist Jean-Claude Juncker. The second is the Council of the European Union (formerly the Council of Ministers) and is also based in Brussels. This body, like the Parliament, passes legislation, often by majority voting. The third, and most recent, is, confusingly, the European Council. This was ratified by the Lisbon Treaty in 2009. It is also based in Brussels. It comprises the heads of state of every member state of the EU. The current President is the Polish Prime Minister Donald Tusk. The EC appoints the head of the ECB and also the High Representative on Foreign Affairs. Increasingly the President of the Council speaks for the EU as a whole in respect of international affairs. The fourth, and least significant, body is the European Parliament. It does not, like the UK parliament, initiate legislation. It can only block or delay it – which it rarely does. It has 751 members. There are 73 UK MEPs, less than 10% of the whole. It is based in Strasbourg, Brussels, and Luxembourg. R. Vinen argued that ‘some began to feel that Europe was being built under the aegis if the Catholic international’ [R.Vinen, A history of Fragments: Europe in the Twentieth Century, p.359], while others, like the leaders of the British Protestant Truth Society, have always believed that European integration is a ‘Vatican plot’ [Protestant Truth Society, New Holy Roman Empire, 1993]. [I]n February 1948 [the Vatican] made a more public appeal for ‘the great nations of the continent’ to form ‘a larger political association’ [W. Kaiser, Christian Democracy and the Origins of the European Union, p.181]. Three months later, Pius XII sent a ‘special representative’ to the Congress (Council) of Europe meeting…Thus the Holy See was at the founding meeting of the Council of Europe and its various agencies…In September 1948 the authoritative Jesuit organ, La Civilta Cattolica published two articles by Fr Brucculieri, SJ, hitherto a fan of Fascist corporatism, strongly supporting moves towards European integration. In June 1950…the French cardinals and bishops publicly ‘called upon all Catholics to interest themselves in, and work for, European integration’, thus making it clear that the Church as a whole was in support of it. As the European project neared realization in 1957 with the Venice conference to create the EEC, the Vatican gave its official blessing. According to the British Minister to the Vatican Sir Marcus Cheke, ‘Pius…missed no opportunity of advertising his sympathy with the cause of a United Europe notably in his address to the Members of the Congress of Europe in June, to Parliamentarians of the Coal and Steel Community in November, and his speech to President Heuss (of Germany) in the same month’ [TNA/PRO, FCO, British Minister’s Report, 1957, p.8]. In the book of Proverbs King Solomon tells us that ‘righteousness exalts a nation but sin is a reproach to any people’ (Prov. 14:34). There is much in this brief but vitally important Bible verse. First, it tells us that nations matter to God. God has ordained that there should be nations. And he speaks to us about nations because they are important. Second, it tells us that God judges nations. He may exalt them – or abase them. The rise and fall of nations is subject to God’s sovereign providence. Third, it tells us that when a nation follows ‘righteousness’ then God exalts that nation. National righteousness no doubt has much to do with the individual character and behaviour of a country’s citizens. But it also is concerned with the nation’s beliefs and laws. Every nation has a duty to acknowledge the true God. Every nation has a duty to shape its laws in accordance with God’s laws. Because the God who made us knows what is best for us, laws that are shaped in accordance with his moral law will benefit men and women as well as bringing the blessing of God. In the United Kingdom we should be deeply grateful that providence has given us a Christian constitution that acknowledges the true God and the authority of his Word. This constitution was bought at a great price by the struggles and sufferings of the Protestant Reformation, the Civil War, and the Glorious Revolution. At the heart of these struggles was the principle that the sixty-six books of the Protestant canon of Scripture are God’s inspired Word. Through it he speaks authoritatively both to nations and individuals. This is beautifully expressed in our coronation service. The Monarch is given a Bible with these words – ‘We present you with this book, the most valuable thing that this world affords. Here is wisdom; this is the Royal Law; these are the lively oracles of God’. How true. God’s Word is living (lively). Through his Word God speaks to us. When we hear and obey his Word he blesses us. When we read and understand his Word we gain wisdom.